This captivating site was the homestead of an English couple that settled in Kenya. Almost a half century later, their home, "The Steep", was renamed the Aberdare Country Club and opened to guests. Located within the Masai Mara Game Reserve, you'll have front row seats to witness the 'Great Migration', where around two million animals pass through the Masai Mara/Serengeti ecosystem in Kenya and Tanzania. Set in the heart of the Aberdare National Park, iconic and yes, quirky. Modeled after Noah's Ark, The Ark has four viewing decks with balconies and lounges to provide superb game viewing from the comfort of the lodge. This Five Star lodge is undoubtedly the gem in Uganda's crown of tourism destinations. With breathtaking panoramic views, the sights and sounds of the Nile, it sets the scene for an adventure of a lifetime. Situated in the north west of Uganda overlooking one of nature's best kept secrets, the River Nile, on its journey from its source at Lake Victoria to join Lake Albert. 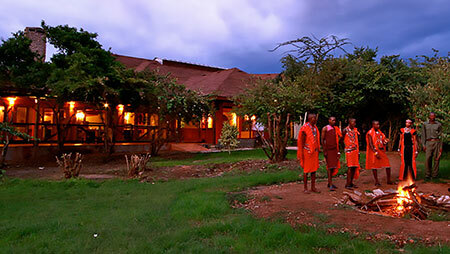 Paraa Safari Lodge offers a unique blend of comfort, relaxation and adventure. Located on a peninsula within the heart of the Queen Elizabeth National Park, Mweya Safari Lodge is surrounded by the magical Rwenzori Mountains aptly described as the 'Mountains of the Moon'. Silverback Lodge, located in the Buhoma sector of Bwindi Impenetrable Forest National Park in western Uganda, Silverback Lodge is only a 5 minute walk to the national park and has sweeping views of the valley and forests that surround it.